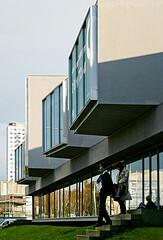 Portuguese architect Eduardo Souto de Moura.is the 2011 Pritzker Prize laureate. In this post and the subsequent posts I’ll try to find out what are his sources of inspiration. Will it help us to add new tools to the “Conscious Inspiration Toolbox” ? 1. 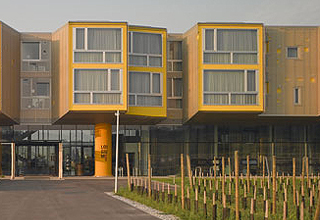 Both buildings deal with the “Edge of the cliff”. 3. The building Deliberate in a Clear direction. A hand with fingers, with a fragmented shape. 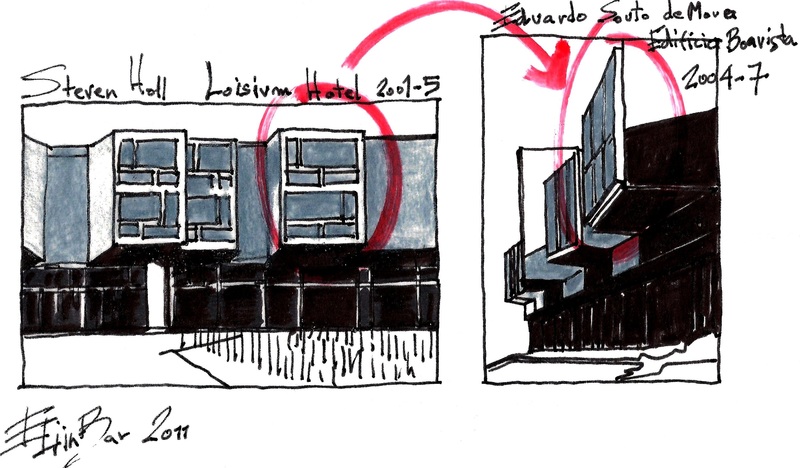 This entry was posted on April 1, 2011 at 1:07 am and is filed under buildings with tags 2011 Pritzker Prize, Conscious Inspiration, conscious inspiration signs, Conscious Inspiration Toolbox, Conscious Inspiration Tools, Edouardo Souto de Moura, eliinbar Sketches 2011, Steven Holl. You can follow any responses to this entry through the RSS 2.0 feed. You can leave a response, or trackback from your own site. 1. you should see some aerial views. the other two are just ridiculous. it’s a little bit hard to make this kind of analogies with contemporary portuguese architecture. if you want to make them go check alvar aalto or mies. anyway you’ll fall in fallacy, just because there is still some architecture that doesn’t match with a “pop” analysis… cute drawings anyway. I agree with you…. both of these buildings has nothing significantly in common (typology, function, “style”, etc.I saw some aerial views)…. I thank you for the opportunity to clarify once again the principles of “Conscious Inspiration”…. The goal is to encourage an architectural planning process that I like to call “Conscious Inspiration”.